Our goal is to transform the eroded hillside next to the tennis court into a beautiful space that fosters community gatherings and picnics, as well as being a quiet retreat to sit and enjoy the views. We would like to create a circular terrace with four light fixtures (matching the current lights in the park) and steps down to a semi-circular deck, extending to the edge of the Monterrey Cypress grove. This renovated area would include six picnic tables, three built into the lower deck. Ecological considerations were a large part of our design. No trees would be removed. As part of the plans, we would plant a handful of flowering evergreen trees to provide tennis court screening and preserve a few of the existing rose bushes. The circular "plaza" would be paved with attractive hexagonal pavers -- used at the DeYoung Museum -- allowing for water percolation and conservation. The deck would be made of cedar, similar to what has been used in Buena Vista Park. We would also plant the hillside below with native plants to prevent erosion and add bird habitat. The plans were designed by the experienced Landscape Architects Tim O'Shea and Todd Cole of Strata, Inc., who generously worked at a pro-bono rate. 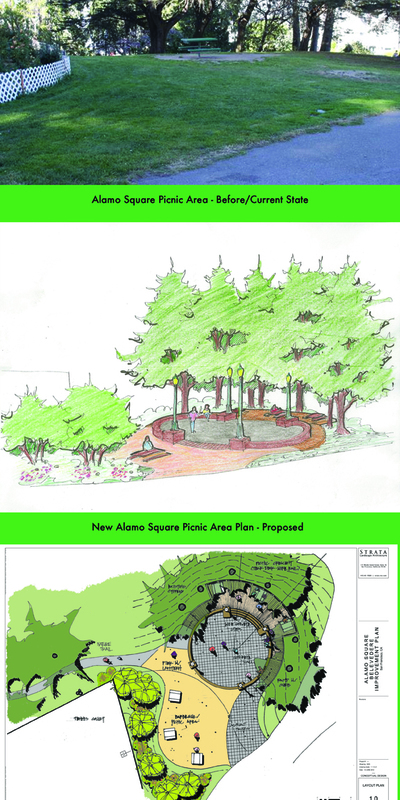 Todd Cole designed the AIDS Memorial Grove in Golden Gate Park and has years of experience working with RPD. We want to create a space that the community will enjoy, and which will be large enough to accommodate school groups, birthday parties, and picnics. It would provide us with a meeting place for neighborhood events. The space may also be reserved on a limited basis by anyone in the community, but in general, it won't be necessary to reserve and would be available for all to use. 1. Strongly Agree - "I am excited about this plan, it will enhance our community"
2. Agree - "I hope this plan gets approved"
3. Neutral/Not Opposed - "It won't bother me"
4. Disagree - "I hope this plan does not get approved"
5. Strongly Disagree - "I am opposed to this plan, I think it will be detrimental to the park"